Samuel Palmer Brooks Hall was the first men’s residence hall on campus–before it was built in 1921, Baylor men lived off campus in rooming houses and other accommodations. Brooks provided the increased male population with another option of where to live, as well as a sense of community. Background on this project: Students in the Higher Education and Student Affairs (HESA) masters program have taken on the challenge of creating original scholarship that adds to what is known about Baylor’s history. As part of Dr. Nathan Alleman’s Foundations and History of Higher Education course, students were grouped under the five class themes: curriculum, finance, students/student groups, access, and religion. In collaboration with Texas Collection archivists and librarians, students mined bulletins, newspapers, correspondence, and other primary resources as they researched their topics. Final papers have been posted on blogs.baylor.edu/hesabaylorhistoryproject and grouped by their particular sub-topic so that patrons, researchers, and other interested persons could benefit from these students’ work. This is the second installment of an annual accumulating project–see last year’s teasers here. Please visit again for future installments! 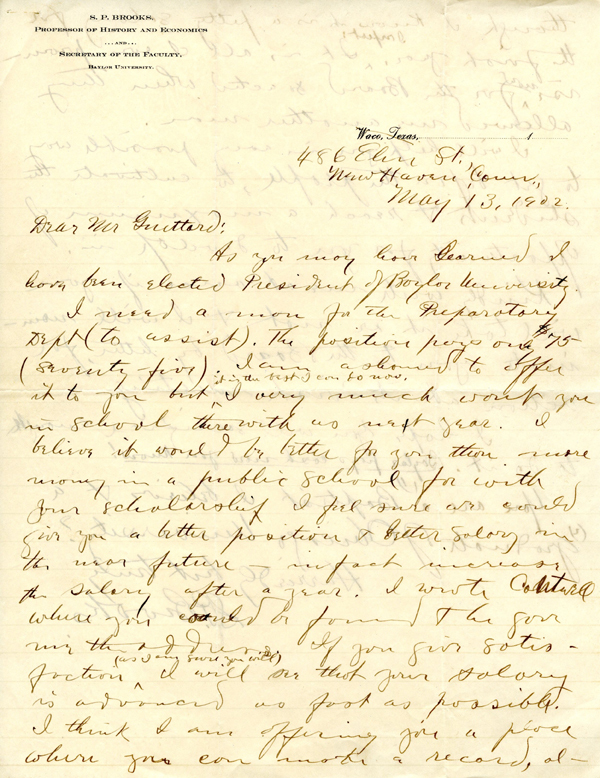 This letter written from Baylor University President Samuel Palmer Brooks is the initial offer of employment made to Francis Guittard. The latter accepted his friend’s proposal and gradually moved up the ranks of his peers to the Chair of the History Department. Samuel Palmer Brooks wrote those words to Francis Gevrier Guittard in a 1902 letter asking for Guittard to come and lend his services to the students of Baylor University. Today Baylor faculty and staff today are given the same message—that Baylor will give them opportunities to develop professionally, while also helping them to cultivate students who will go above and beyond. We see the fruits of this support from Baylor as we celebrate each graduating class. But some professors, like Guittard, offer an especially good example of what is possible. On this Commencement weekend, we offer the graduating class Guittard’s story as a model of lifelong learning and service. Guittard’s beginnings are similar to that of many others who lived in late nineteenth century America. His father, Dr. Francis Joseph Guittard, had immigrated to the United States from France. The elder Guittard, who had renounced his parents’ desires that he pursue the Catholic priesthood, moved to America in search of a better life. He settled in Ohio, where he met his wife, Lydia. As the younger Francis came of age, his parents agreed that the economic prospects in Ohio were bleak. Thus, in 1886, the Guittards sent young Francis on a one-way trip to Texas with the hope that he would succeed and find financial success. Francis Guittard with Mrs. Norman Smith, 1927, at the Sam Houston piano at The Texas Collection. 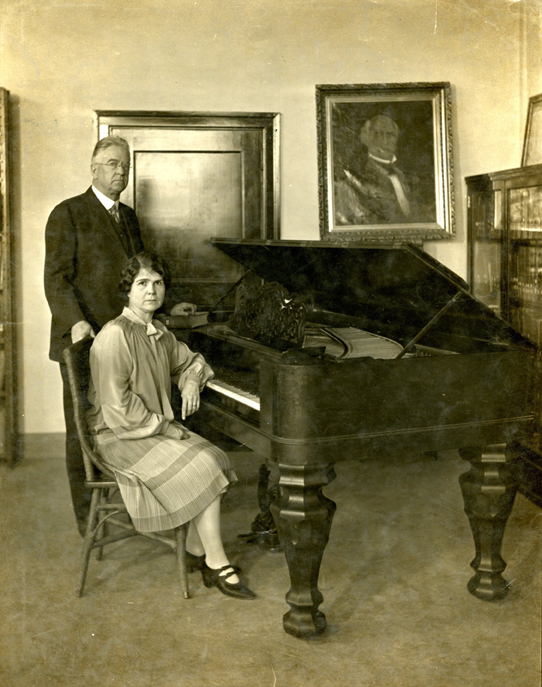 Guittard and his wife, Josephine, helped to bring the piano to The Texas Collection. Now on his own, Francis decided that the medical profession his father had pursued was not for him. Instead, he wanted to teach history. In the early 1890s, Guittard attended Baylor University but was unable to complete his degree. Not to be deterred, he applied to the University of Chicago, one of the nation’s rising schools. It was here that Guittard earned his bachelor of arts in 1901 and his master of arts in 1902. Armed with his new degrees (and following the letter quoted above), Guittard returned to Baylor University. His friend, Samuel Palmer Brooks, had just become President. Neither Guittard nor Brooks knew at the time just how long they would serve Baylor and her students. For over forty years, Guittard taught in the Baylor history department, serving most of these years as the department’s chairman. He also was an adviser to the debate team, offered input on Texas Collection acquisitions (including the Sam Houston piano pictured above), helped coordinate the first Homecoming, and made many other contributions to the lives of Baylor students. 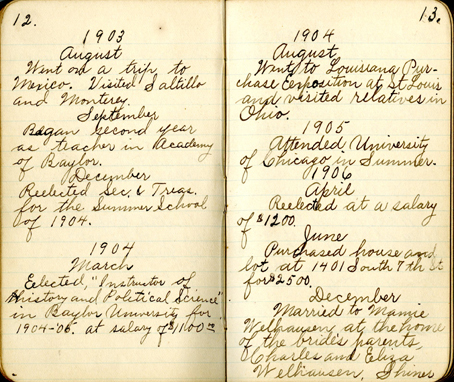 This excerpt from Francis’ diary highlights some of the key events in his life including his promotion to an instructor of history, his attendance of the University of Chicago, and his marriage to his first wife, Mamie Welhausen. 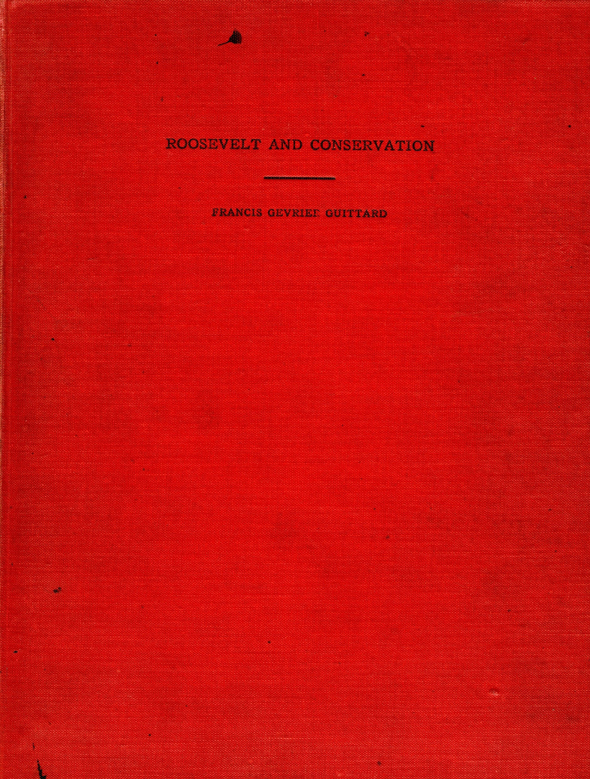 Dr. Guittard earned his Ph.D. with the completion of his dissertation concerning President Theodore Roosevelt’s views of conservation. Notecards, an unpublished manuscript, and a final draft relating to the project can be found in the collection. Dr. Guittard continued to teach at Baylor and cultivate young minds with a love for history until his passing in 1950. Even now, he continues to support the education of others through the Guittard Fellowship, a family-funded scholarship given to first-year history graduate students. (In fact, I was a grateful recipient of that fellowship.) Guittard showed how one can shape the future, even while preserving history. The Francis Gevrier Guittard papers, which consist of 38 boxes, house the personal and professional papers of Dr. Guittard. Because of Guittard’s long tenure at Baylor University and his desire to remain relevant in his field, researchers can find a number of subjects to explore in his papers. Come to The Texas Collection and discover the legacy of a man who not only improved his own lot in life, but then went on to devote his time and energy to the education of the up-and-coming generation. And to the graduating class of 2013—remember to walk in Guittard’s footsteps and pursue lifelong learning as you shape the future. 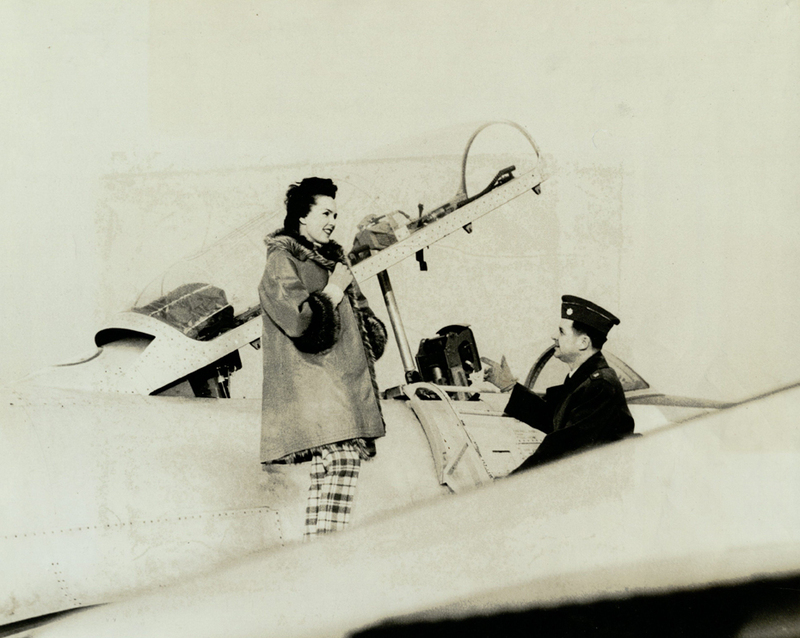 Many photos of Jules Bledsoe are showcased in the exhibit Mary Ellen helped curate. In this image, we surmise that he’s en route to Europe, where he performed in numerous countries until the outbreak of WWII. My name is Mary Ellen Stanley, and I am a second year museum studies master’s student from Fort Worth, Texas. I have worked at the Texas Collection (TC) since June 2011 as a graduate assistant. Coming from my undergraduate institution, I previously had little experience working with archives, but a decent amount of museum experience through various internships. Although this previous knowledge has helped me in my work at the TC with object handling and tackling obscure software, I have learned that these two types of institutions are extremely different. Even though I was skeptical and thought that I would not like working in an archives as much as a museum, I have gradually grown to love archives more. When I first started at the TC, my main focus was processing a part of the Pat Neff collection. The experience working on this large collection provided me with a wide variety of skills that I have continued to use both in and outside the Texas Collection. This past fall I helped work on processing numerous small collections while co-curating the exhibition, “Swing Low, Sweet Chariot: The Musical Heritage of Jules Bledsoe and New Hope Baptist Church.” Working on this exhibition was one of the highlights of my time at the Texas Collection because I got to utilize the knowledge I have gained from classes in a real world situation. My favorite activity at the Texas Collection is processing photographs. With my work, I have truly grown to appreciate how history can be documented in one beautiful snapshot. Working with these photographs makes each day exciting and unique. My name is Adina Johnson and I am a second year history master’s student from Tucson, Arizona, and Minneapolis, Minnesota. I have worked at The Texas Collection since May 2012, and I plan to continue working here while I pursue my PhD in history at Baylor. Before working at the TC, I had little archival experience except for tasks I performed as an undergraduate assistant for a history professor. During my first year at Baylor, however, I had the privilege of working on a major research project where all of the primary and secondary documents were housed at the TC. Therefore, I was familiar with the archival organizational systems at the TC. The very first task I was assigned at the TC was to organize letters from the Dr. William Benjamin Worth Watkins papers. The dialogue between Dr. Watkins and his family that continued through his deployment for World War I instantly captivated me. When I found the envelope bearing the “deceased” stamp (Watkins was killed in the war), it affected me deeply. I began to see that my passion for history would lead to a love of archival work. The rest of my first summer at the TC was spent processing a large number of scrapbooks for the Pat Neff collection. Since then I have processed 12 record groups on my own, including the Oscar “Doc” and Mary “Kitty” Jacques Du Congé papers (Waco’s first African American Mayor) and the Grace Rosanky Putnam Jones papers (Texas’ Queen of Fashion). As I pursue my PhD in History, I am thankful for the experiences that I am gaining at the TC. I will be a better researcher, teacher, and writer because of my time here.